Introducing our brand new varifocal lenses, SeeMax Master, Presio Master FP and Presio Master. All are designed to reduce distortion in the peripheral portions of the lens, and are digitally enhanced for stress free vision. Master lenses are optimised in Japan via Nikon’s Optical Design Engine and manufactured in the UK. Available to order from your local Nikon lenswear stockist now. In spite of the many technological advances in varifocal lenses, most wearer’s can still experience visual stress in specific situations such as driving, juggling between the television and a mobile phone, and reading wide documents. These are moments where discomfort may be experienced, even with the best lenses and even with the latest designs. Nikon’s brand new ‘MASTER’ varifocal lenses provide wearers with stress free vision, thanks to Nikon’s 3rd Generation Aberration Filter Technology. Master utilises this technology to remove the distortions and blurriness usually experienced on the peripheral portions of the lens. Two main technologies, binocular tuning and deformation tuning, reduce the swimming effect to create a more stable image, whilst removing blurriness by matching the images perceived by the left and right eyes. This reduces wearer’s visual stress to a minimum level. In order to ensure the superiority of Master, Nikon R&D completed thorough testing. Using an eye tracker device, R&D researchers were able to determine the usable surface of a lens. With a standard lens, the wearer experiences visual stress and needs to move their head around to find the right spot. With Master, the usable surface is a lot wider, the peripheral portion of the lens can be used, and visual stress is removed. 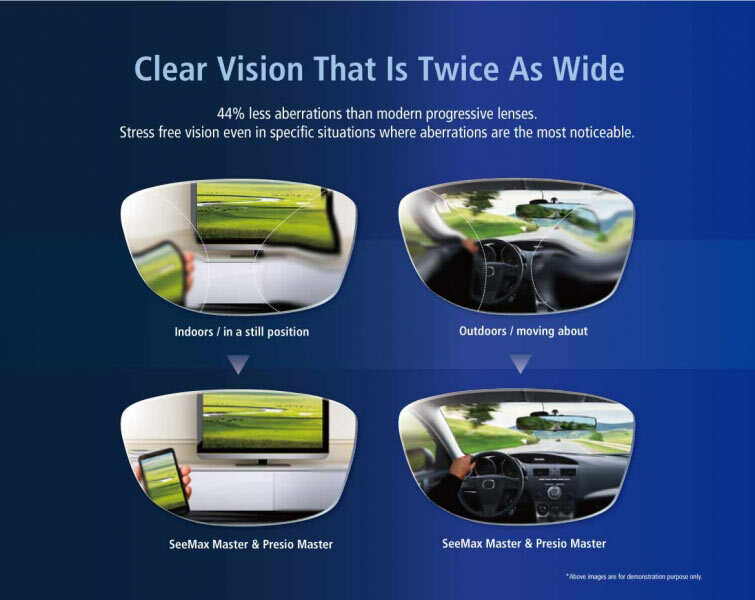 Master offers the lowest level of distortions possible thanks to this advanced technology; providing the wearer with clear vision, allowing them to see freely without restriction.